D.85 The Visitation or Vertumnus and Pomona? L.11. Madonna and Child with standing Male Saint holding a staff at the Left and St. Catherine of Alexandria at the right, and Other Saints?, possibly The Mystic Marriage of St. Catherine, with an Angel playing a Lute in the center below. 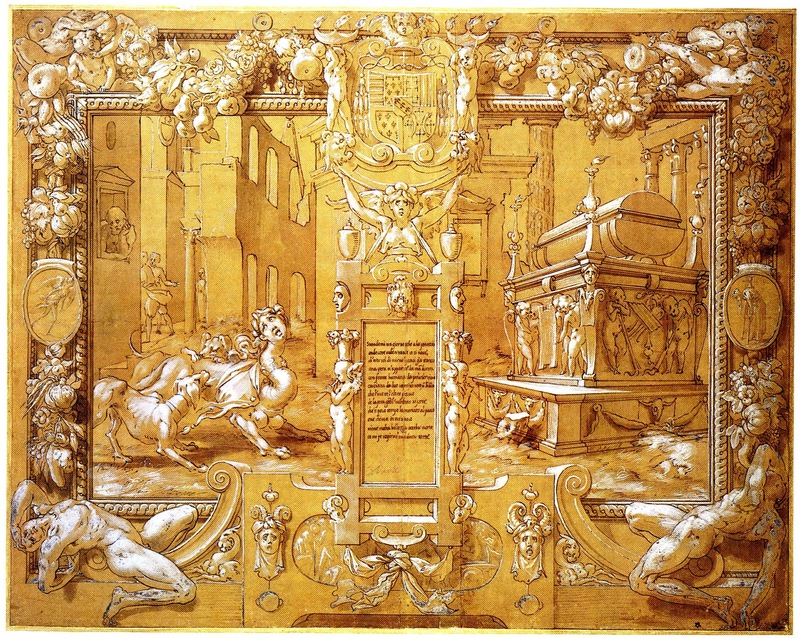 L.13 Decoration of the Custom Officer’s Station and of the Area between the Porta San Gallo and the forward Gate (Antiporta) related to the Triumphal Arch erected for the Return Entry of Pope Leo X into Florence, 22 December 1515. Etching, Anonymous, 16.1 x 24.8 S (Vienna). Bartsch, XVI, 1818, 425, 119, as Anonymous, School of Fontainebleau. Herbet, V, 1902, 73 (1969, 225), 101. COLLECTION: Vienna, H.B.XIII, 2, p.61, no. 413, as after Rosso; slightly damaged at the upper center and right and at the bottom. LITERATURE: Zerner, IB, 33, 1979, 394. 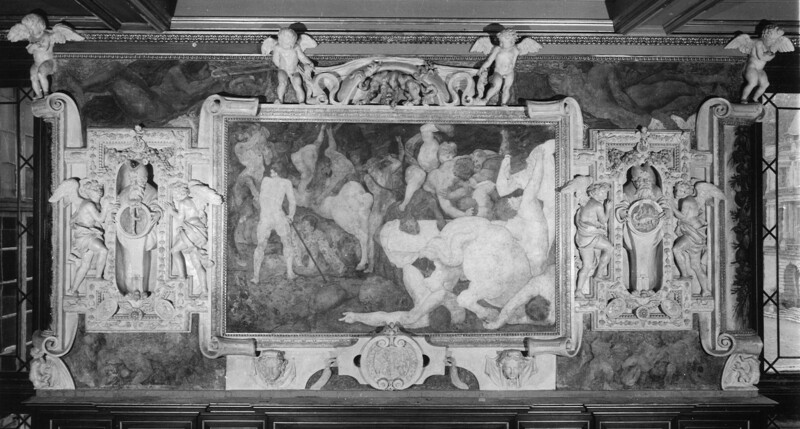 The cherubs in the two groups flanking the central image are very similar to the various putti that appear in the Gallery of Francis I, especially those in the Venus and Minerva (Fig.P.22, I N a), those beneath the side panels framing the Combat of Centaurs and Lapiths (Fig.P.22, I S a), the ones in stucco above the Education of Achilles (Fig.P.22, II N a), those framing the Danaë (Fig.P.22, IV S a), and the pairs beneath the side panels flanking the Cleobis and Biton (Fig.P.22, V S a). They have the same kind of robust physiques and show the same kind of energetic and interrelated activity. The two identical but reversed cherubs reclining at the top of the cartouche are somewhat more graceful and charming and look similar to the playful putti in the Venus and Minerva fresco, and those in stucco above the giant to the right of the Education of Achilles. 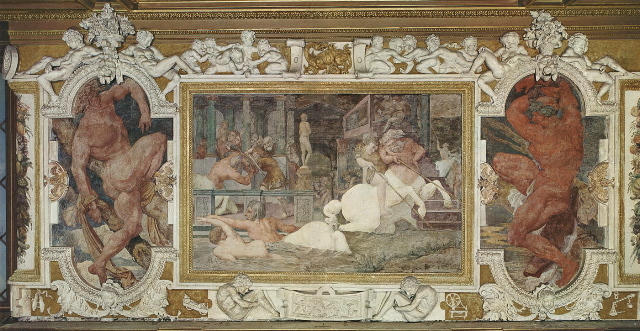 The bands of decoration and the motifs above and below the central image could be by Rosso, although they do not quite look like any of the decorative details in the Gallery of Francis I. Also, the curves made by these bands and the ways they are related, forming incomplete circles meeting the mandorla shape formed by other bands in the center, are not like any arrangement in any work known to have been designed by Rosso. Nevertheless, the shapes here may be due to the fact that this cartouche is part of a frieze, in which this etched section seems to have alternated with more simply framed circular or oval areas indicated by bands at the outer edges. What does not look like Rosso’s is the figure of the Magdalen. But this could be because of her small size and because tradition required that she be shown in this way. The sketchy manner in which she is rendered could also account for her not appearing like a Rosso invention. One could also believe that this figure is an invention by the etcher. Yet the mandorla shape in which she is placed is appropriate to the subject of her assumption and the action of the flanking cherubs indicates that they are partly supporting this mandorla, which iconographically makes sense as well. Below the image of the Magdalen and appearing as part of the decoration of the frame that surrounds her is an object that might be a jar of ointment. All of these details suggest that the figure of the Magdalen is an integral part at the center of this cartouche. 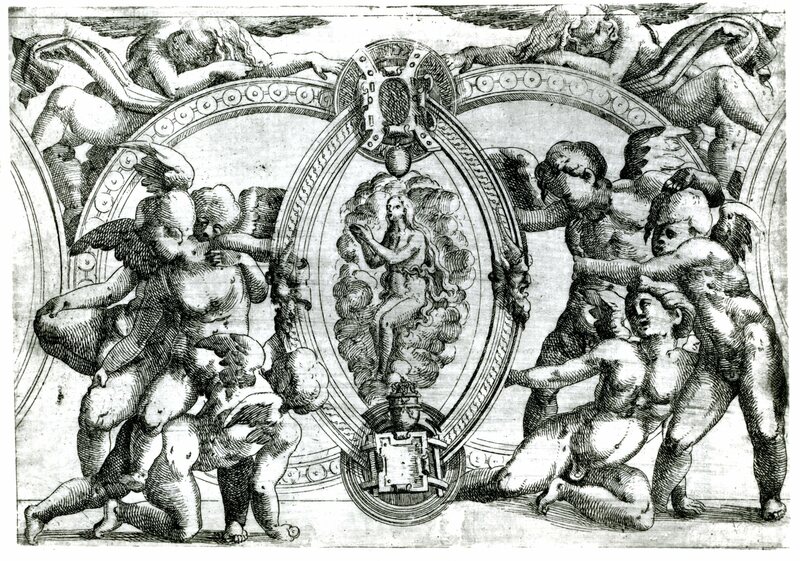 Even in this case, however, the etcher may have supplied his own figure, which he knew belonged here but which was missing from the drawing by Rosso he had before him. Or this image of the Magdalen reflects one that is here replaced or duplicated in this frieze. In the small oval above the Magdalen is a group of very simply sketched figures. Rosso’s drawing could have contained it, as similar scenes appear, simply sketched, in his Petrarch drawing at Christ Church (Fig.D.47a). 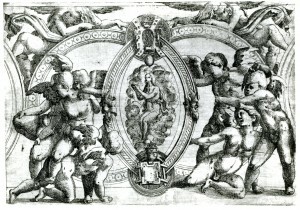 While the cherubs in the etching strongly look like Rosso’s inventions, and probably ones not dating from before the middle of the 1530s when his French art began to achieve the kind of robust style seen here, the whole design of the print cannot be quite so confidently accepted as his. 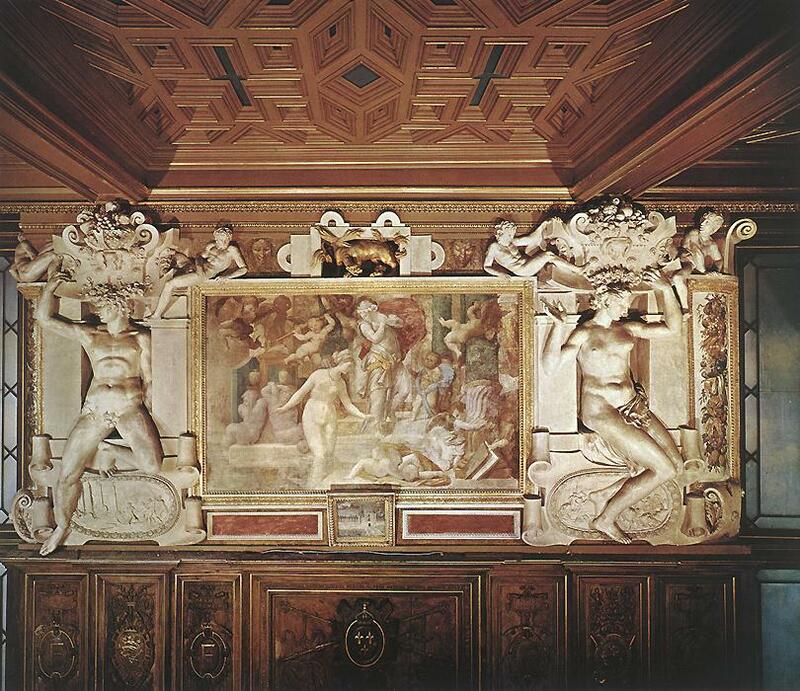 But if it is Rosso’s, it presents evidence of a religious project, and one of some extent to require a frieze. The etching suggests a project of stucco and painting. 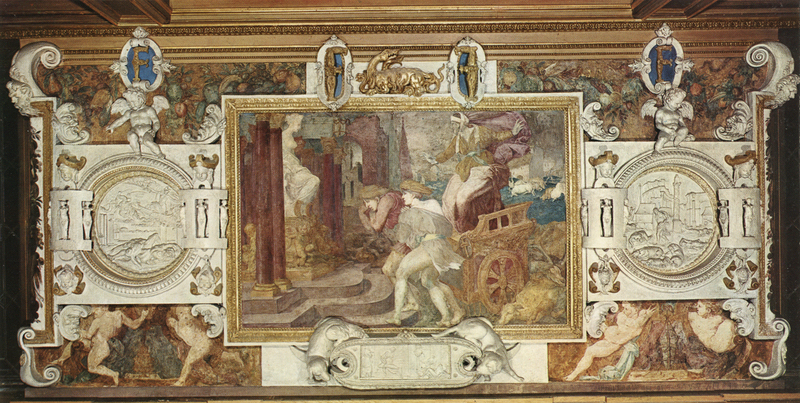 Although there are documents telling of Rosso’s work in Notre Dame in Paris, none specifies a frieze of any kind (see L.54-L.56).